This clock is adorable - and being a fellow Massachusetts resident, I was thrilled to see it was made in Mass! My mother purchased the stationary robot clock for my nephews and it was a huge hit too. I can't get over the fish bone pendulum. So creative! Absolutely recommend this 100%! Will be buying more in the future as gifts! The fox pendulum clock makes me smile every time I look at it. So creative! I was a little surprised when she opened it, cuz it seemed to be such a light color, but she loved it. It was exactly what she needed to finish her room. I intend to either buy the fox or the robot for his birthday. Purchased this as a gift for my granddaughter . . . well, truth be told, more for her parents as they are decorating her room in a nautical theme. Their little girl is still too young to fully appreciate it, but the parents love it - as does grandma! Wonderful craftsmanship and design. Looks great hanging on the wall. Little fish bone pendulum is such a clever touch and adds a lot of appeal to this adorable clock. I haven't seen the clock myself but I am thrilled with it nonetheless. When I saw it on The Grommet, I knew it was just the present I wanted to give my thirty year old daughter living in Kosovo. She was fascinated with sharks since she was two years old swimming with one hand out of the water as her shark fin. When she unwrapped the clock on Christmas she loved it! This was a Christmas gift for my 13 year-old son. He loved it. He assembled it and promptly hung it in his room. It is well made and works like a charm. Love it, the pic makes it appear blue. It's not its grey/blue. But still well built and very cool. 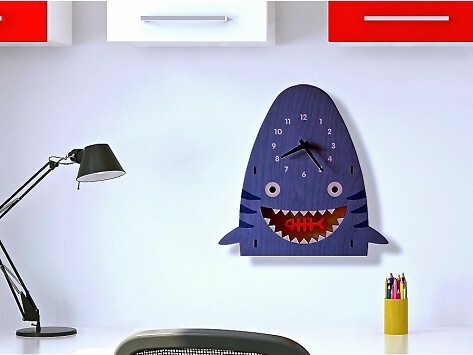 Very unique and fun clock. The color I received is a little different than shown but we like it. Paul Ocepek had some time on his hands. He started sketching, then tinkering with a laser cutting machine, and soon he was creating 3D models of his playful characters and turning them into graphic clocks. Each of Paul’s creations is loaded with personality. His pirate looks mischievous but not menacing, and the clock bot is charmingly robotic. 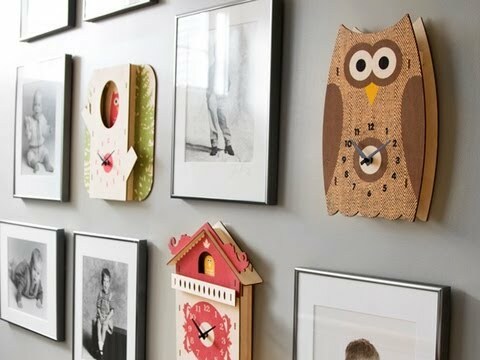 The tweedy owl has a quirky, mod vibe, and the sockmonkey delivers just the right dose of cuteness. These funky time-keepers can stand on a tabletop or shelf, or hang on a wall in the kitchen, bedroom, or family room. Paul, who’s trained as an industrial designer, makes each Modern Moose clock to order in his Norfolk, MA studio. He uses birch plywood and nontoxic water-based inks (there are no glues or chemical coatings). He cuts the wood pieces with a laser, sands the pieces by hand, applies color using a special ink-jet printing process, and then assembles the parts by hand to create his layered compositions.